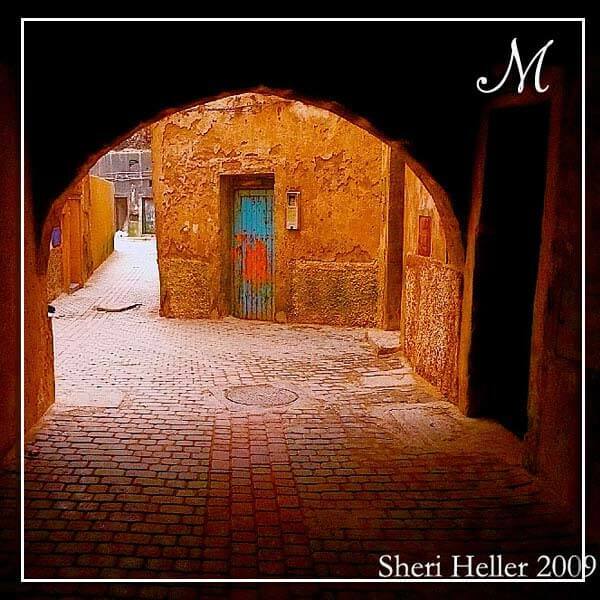 Private Morocco Tours ~ See The Kingdom of Morocco! “We don’t believe that one size fits all! We’d love to work with you to create a customized trip that is perfect for your group. Upon arrival in Casablanca, the economic capital of Morocco, you will be met by your private driver and transferred to your Casablanca hotel, where you will check in and relax for the afternoon. 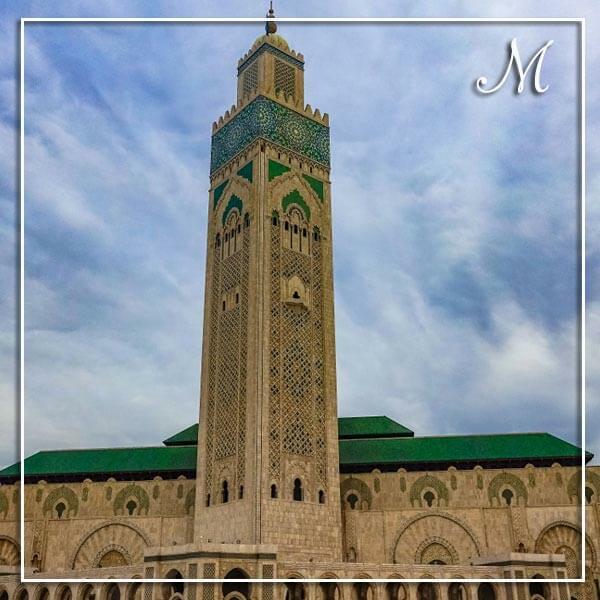 Depending on time, you may include a visit to the Hassan II mosque, one of the world’s biggest mosques. Dinner will be served in the hotel. After breakfast and at your convenience, you can travel on towards Rabat, the capital city and residence of the King. You will have a tour of this historic city including the Chellah, La Tour Hassan, Mausoleum, and King’s Palace. Dinner will be served in the hotel. After breakfast, you will leave by van towards Fes. In the morning you can explore the 2000-year-old ruins of Volubilis and get a picture of life during the Roman Empire. From there you will head to Meknes and have a tour of this Imperial City. You will visit the famous Bab Mansour, Granaries and stables of Moulay Ismael. In the evening, you will finish the drive to Fes. Dinner will be served at the hotel. After breakfast you will begin your guided tour of the medina, one of the world’s largest walled in cities. You will explore the narrow streets lined with fresh fruit, mounds of spices, intricately woven Berber carpets and many other art objects of Morocco. A visit to the King’s Palace, the tanneries, and potters are just a few places you will experience. For lunch you will eat in a traditional restaurant in the heart of the medina. After lunch you will complete the tour. Your evening meal will be in a local restaurant. This will be a free day to explore Fes. Dinner will be in the hotel. After an early breakfast, you will depart for Marrakech. The beautiful drive will take you up into the Middle Atlas Mountains and along the base of the High Atlas Mountains. 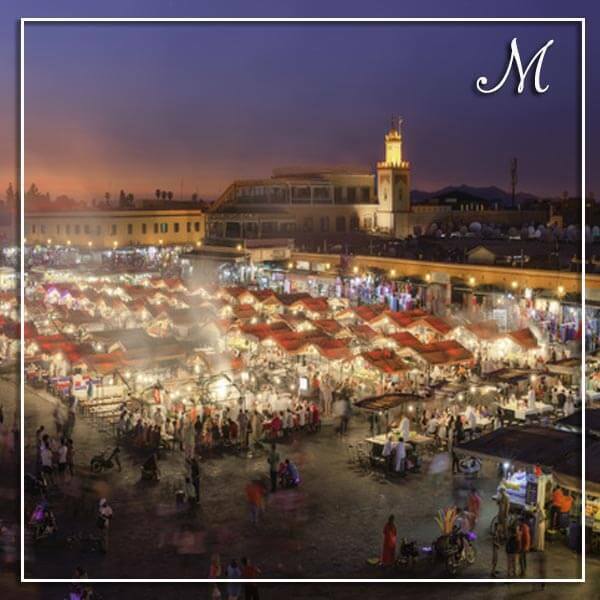 Once in Marrakech, you will check into your hotel and then head off to the Jemaa el-Fna, the center square of the medina. Coming alive at night with the local storytellers, entertainers, and mouth-watering barbeque pits, the square is well worth a visit. A quiet cup of tea on the terrace of an adjacent café provides a spectacular aerial view of the bustling square. Dinner will be served in the hotel. After breakfast, you will have a guided tour of Marrakech, the southern pearl of Morocco. You will discover the Palace of the Bahia, the Saadian Tombs, and many other hidden treasures. After lunch, you will continue with the tour on to the magnificent Koutoubia Mosque and the famous Jemaa el-Fna, one of the center attractions of Marrakech. The tour will conclude with an exploration of the souk (market). Dinner will be served in a local restaurant. This day will be a free day in Marrakech to explore the city. Dinner will be served in the hotel. After breakfast, you will set off to the coastal city of Essaouira, a picturesque fishing town, lying on the southwest coast of Morocco. With an exquisite beach to the south, Essaouira has become one of Morocco’s most popular coastal towns. Many of the countries wood carvers and artists make Essaouira their home. Lunch will be served in one of the restaurants in the medina. Your last day of travel will take you back to Casablanca. You will leave Essaouira for Casablanca with a stop at El Oualidia on the way. You will drive along the coastline to El Jadida where you will visit the citadel and see the underground cistern. You will then continue on to Casablanca, where you will spend your last night in the country. After breakfast, you will be transferred to the airport for departure. * All prices are in US Dollars, per person. There is additional 10% fee for tours including the dates between Dec.20 – Jan.5. For single rooms, a single supplement fee will be applied. Tell us about your vacation on the short form below! How many people are you traveling with? Is this tour right for you? Tell us a little about yourself and let us know any questions you may have about this tour or any other. Our knowledgeable and kind staff is standing by to respond personally to you.